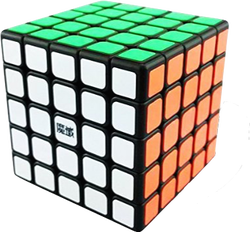 This cube is more similar to an Aolong than an Aosu. It's fast, cuts well, and has a somewhat bumpier, smoother feel than the Aosu. It can lock up and shapeshift, but it doesn't pop very frequently. This cube is definitely an improvement over the shengshou. It is decently fast, but it is very prone to lockups, which is frustrating. It's hard to tension so that's it's fast but doesn't lock up like crazy. Turning accuracy is a must.